Mina Mooney is about to discover that when you're at the top, the only place to go is down. . . It's springtime in Del Rio Bay, and everyone's heading to the O.C. to catch the varsity cheer squad compete at the Extreme Nationals. Everyone's pumped, especially Mina Mooney, because making the elite squad has finally gained her entrance into the Upper Circle. Mina's psyched for the big show--and some unsupervised cuddle time with Brian. Best of all, her number-one enemy, Jessica, has shocked everyone by calling a truce. But little does she know that Jessica's peace offer is nothing more than a disguise for what she really has in store for Mina. . .
Spring break means all sorts of trouble for Mina's friends, too. Lizzie, whose focus has never strayed from the books, is boy crazy for the first time in her life. Kelly's decision to give ex-hustler Angel another chance just might backfire. And Jacinta is having a hard time breaking things off with Raheem--even when he does something utterly unforgivable. Fun, fast-paced, and impossible to put down, That's What's Up! proves that when it comes to popularity, you better watch your back. Paula Chase Hyman lives in Maryland with her husband and two daughters. 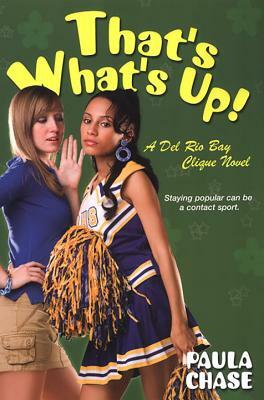 A former competitive cheer coach, her writing has appeared in Girls’ Life, Sweet 16, and Upscale magazine. She’s a founding member of The Brown Bookshelf, a national initiative dedicated to spotlighting African American children’s lit authors flying under the radar.